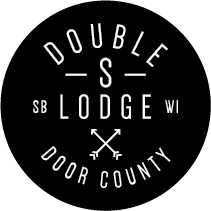 The Double S Lodge is a rustic luxury hideaway located on the beautiful Door Peninsula in the village of Sister Bay, Wisconsin. We’re just a short bike’s pedal away from boutique shops, fine dining, throwback bowling lanes and watering holes, shiny sailboats, and infinite sunsets. Just down the road you’ll find succulent tree fruit to pick, fine local wines and beers to sip, and beaches that will stretch your legs and your imagination. At the lodge, we pride ourselves in creating an unparalleled guest experience that allows you to detach from your daily routine, unwind in service-oriented luxury, and reconnect with good company and nature. So come for the cheese and cherries, stay for the relaxation and recreation, and bring your best fish story to share at an evening fire. © Copyright 2014 Double S Lodge. All Rights Reserved.